A colleague wrote, “Rabi appears to . . . ask the question, ‘If I were an electron, what would I do? '” The contribution of Isidor Rabi to 20th century science. This is for Sunday, July 29 — the anniversary of the birth in 1898 of scientist Isidor Rabi. Photo of apparatus for able substances circa 1938. Photo courtesy of Research Corporation. At the beginning of this century, the x-ray was a revolutionary diagnostic tool that allowed doctors to “see” inside the body. But today doctors can diagnose brain tumors, spinal disorders, multiple sclerosis, and cardiovascular disease using a procedure that’s far more accurate. MRI stands for “magnetic resonance imaging.” And unlike x-ray radiation, which can damage cells, the MRI is without risk to the patient. Isidor Rabi was one of the scientists who laid the foundations for the MRI. In the 1930s, he figured out a theoretical basis for magnetic resonance — how atoms absorb energy in a magnetic field. Inside an atom, protons and electrons are spinning — and as they spin, they act like tiny magnets. When they’re exposed to a magnetic field, the rate and direction of the spin is affected. Rabi’s work made it possible to measure magnetic properties of atoms and molecules with great accuracy. The MRI is based on the way atoms behave in a magnetic field. As part of the process, the patient is placed between the poles of a very large magnet. The result is an image of the inside of the patient. Rabi worked out the theoretical basis for magnetic resonance. He did this using a beam of atoms in the gas phase, ie., vaporized atoms such as sodium into a high vacuum and then directed the beam through a magnetic field. He was able to prove atoms have a net nuclear spin and magnetic moment, which until that time were only theoretical concepts. So he experimentally showed the possibility of magnetic resonance methods and measured the magnetic moments and spins of many atoms. The practical side of this was adapting it to more molecules in solution vacuums are expensive and applicable to a limited number of studies. Most studies are done on molecules in solution or in solids. Applying the magnetic resonance principles to solutions resulted in the development of NMR nuclear magnetic resonance and MRI magnetic resonance imaging essentially the same thing. and ESR electron spin resonance. Magnetic resonance refers to the resonant absorption of energy. Like the sympathetic vibration of a tuning fork when an identical one nearby is struck. The basis for this is that a charged particle such as a proton in a nucleus or an electron can be regarded as spinning, like a top. The spin of an electron or proton has a value of 1/2 and when placed in a magnetic field can spin in one of two directions clockwise or counterclockwise. +1/2 or -1/2. It is also precessing, like a spinning gyroscope, with a certain frequency. If a source of energy with the same frequency, radio frequencies for example, is applied, the particle can resonantly absorb energy and change its direction of spin. We can detect this absorption of energy as a spectrum. The spectrum gives us information about the chemical environment the nucleus is in and hence NMR is a popular tool for chemists. MRI is used in medical diagnosis and is based on the same principle for example the protons in hydrogen water in cancer cells seem to respond differently than in normal cells. Isidor I. Rabi won the 1944 Nobel Prize in physics for discovering and measuring the radio-frequency spectra of atomic nuclei whose magnetic spin has been disturbed. Rabi helped develop radar and the atomic bomb during World War II. He was known primarily for his work on magnetism, molecular beams and quantum mechanics, and was credited, along with his friend, J. Robert Oppenheimer, with bringing quantum physics to the United States. He also spent much of his time after World War II trying to convince the world to use atomic power peacefully. Mr. Rabi was born in Austria in 1898 and brought to the United States by his parents a year later. He grew up in New York City and studied at Cornell, Columbia and in Europe. Rabi died in 1988. Some of Rabi’s molecular beam research was sponsored by Research Corporation. His first R.C. 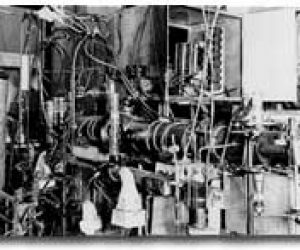 grant was in 1931 for molecular beam research. He was also awarded an R.C. grant in 1937 for research on the magnetic moment of the atom. This one was renewed in 1938, 1939, and 1940.